Brought to you by Basic American Foods. After this winter’s record-breaking cold—and the dip in business it caused for some locations—operators are eagerly anticipating summer’s imminent return. And it’s not just the warm temperatures they’re looking forward to: The summer season provides the perfect opportunity for restaurants to incorporate seasonal flavors into menus. Naturally, many of the flavors typically associated with this time of year stem from the wide variety of produce available. 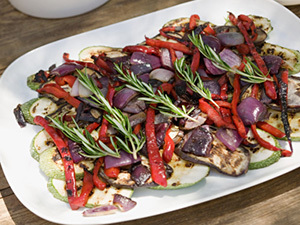 Menuing dishes that highlight summer vegetables such as corn, tomatoes and cucumbers, as well as seasonal fruits such as peaches, berries and watermelon can be an easy way to offer consumers the season’s fresh, juicy flavors. Additionally, using seasonal herbs like chives, basil and rosemary in main dishes and side items—or even in cocktails—can elevate both new and existing menu items by giving them a seasonal spin. Summertime is also barbecue time, and the smoky notes found in BBQ and grilled meats are gaining traction with operators. In fact, 45 percent of chefs surveyed identified smoking as an on-trend preparation method, according to the National Restaurant Association’s 2014 Culinary Forecast. In addition to actually smoking or grilling meats and vegetables, liquid smoke flavorings or smoked paprika can lend charred flavors to summer dishes.